Birthday: December 25, 1909 Height: 140 cm The heroine of the story. Victorique has the appearance of a small, almost doll-like, girl with long golden hair and emerald eyes and a voice that sounds exactly like that of an older woman. It is mentioned once that she is 15 years old. Another important part of Victorique's appearance is a pipe that she smokes when thinking about something. She spends her days at the conservatory at the top of the library, reading several difficult books, often in different languages, simultaneously. She points at one wall of the library and has told Kazuya that she has read almost all the books over there. Along with her sharp tongue, abusive bluntness and eccentric attitude, she possesses amazing detective skills. After Victorique saves him from a near-arrest, Kazuya finds himself being entangled in every new mystery. Because her mother was a mistress, and according to Victorique "a dangerous person", she was imprisoned in the depths of the de Blois mansion where she developed very un-childlike mannerisms. She was sent off to school under strict orders to never leave the campus (although Grevil sometimes obtains special permission to take her out). When she first met Kazuya she didn't like him and thought that he was annoying and stupid for climbing up all the stairs in the library. She even ignored him and made fun of him, but gradually warmed up to him and began to trust and cherish him. She enjoys "reconstructing chaos" and often complains of the boredom that causes her headaches. Victorique also seems to love sweets, since she's always really happy when Kujo gets her anything sweet. 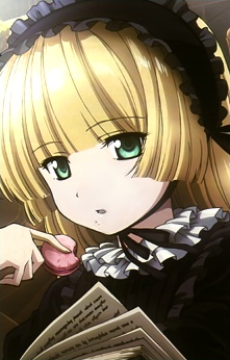 (Source: Wikipedia) Note: The character's name is Victorique. This was shown in the 9th episode. Her name was written at the top of a letter, and it clearly said "Victorique" and not "Victorica". Official Tokyopop localizations also translated her name as "Victorique". Please do not change the name. In the end she is shown to have found Kujou's family during/after the war and waits with a family member at the place of the returning soldiers. When he comes they walk hand in hand towards a great lightning where its seen that she wears a dress which looks like a wedding dress.